Crazy blurb *jolt*, crazy-big reader love for it and an awesome author, all in one? MINE! Upon its release I couldn’t help but squirrel from my TBR list, one-clicked it and jumped right in. Sounded dark and intriguing, and creepy, and exciting, and like it had the potential to be a totally unconventional love story. Lisa: I’m about to start Corrupt. It sounds like a tummy twister and I’m not certain where the romance comes into it cos they don’t appear to have any L.O.V.E. for each other in the blurb. Unrequited love with a rich bully ring-leader of his bully crew? Why yes please, I’d love to! Jen C: I finished Corrupt last night and I’m right there with you all – massive book fog. Loved that book so so much – Ms Douglas did it again!! The characters, the writing, the story and character development, the ending. Everything was so on point for me! Jean: I am in an absolute book fog over Corrupt too! I could not put the book down! Amazing!!!!!! That last line of the Epilogue had me grinning like a crazy person! Hard to start a new book now……. Grey: I’m reading corrupt and it is effectively ruining my life. Just want you all to know… I’m supposed to be writing. Nope , I’m reading… Supposed to be cleaning… Nope reading… Supposed to be eating lunch…nope you guessed it, reading. Gah, this book, these Horsemen. This girl…WTF is going to happen, she just robbed her own store, I have pretzel tummy in a major way. Allison: I finished Corrupt and was in a book haze for a day there. Loved it so much. 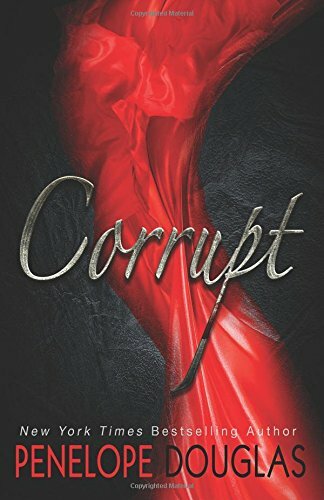 Lisa M: Home sick today what’s a girl to do….read Corrupt all day!!! Yipee!!! Just finished. So good!!! I was on pins n needles all day!! Holding my breath, what’s going to happen next??? Hot hot hot!!! For those of you that have finished you know what I’m talking about!!! Love Penelope Douglas’ books!!! Day book hangover now….what should I read next??? Stephanie: Just finished Corrupt by Penelope Douglas. WOW! This book is major intense. It’s different and I had a hard time reading some of it. As the big confrontation is happening, I was feeling some serious anxiety. Didn’t know how far it would go. Overall I did enjoy it and would love to read a follow up with Kai and Will. Big confrontation? HECK YES. A few in fact. ‘Cause she wasn’t just in love with the school “bad guy”. She was about to become his target. Yep. I went in with anticipation and dread, ’cause this band of rich-boy bullies were going to exact their revenge on that one very unsuspecting girl… our heroine. In fact, she was his brother’s “girlfriend”. Being groomed into the family and her godfather (said bully’s father), took her in as his own, and had very specific plans for her. You’ll learn that part soon enough. So what’s it about? I’ll go simple with this as the details are revealed step by step along the way, via both the heroine’s POV, and the main bully’s POV, from past to present. It gets a little confusing at times as I tried to remember who’s head I was in, and if I was in a “past chapter” or “present” one, but it fell into place rather nicely, despite my occasional confusion. She was living with a wealthy family (seemed like a loving, but typical “rich family with expectations” atmosphere) and went to high school with both brothers. One was the “solid” reliable good boy (her boyfriend, that she was just “meant” for), and his older, basketball star brother… the bad boy that drove his family crazy. Bad boy antics, ‘tude, and the like. Plus, he and his friends were respected and feared as they ruled over their high society entourage, wearing masks and causing mayhem and mischief wherever they went. Breaking the law? Sure! He flashed me a smile as Skillet’s Monster filled the car, pumping through my veins. with fun and danger to be had… a few too many times. I felt like I could trust her. It had been a mistake that cost my friends their freedom. Wrong place, wrong time, and now she was caught up in their whirlwind. Erika Fane played her parts well. The dutiful, self-sacrificing daughter for her mother, the pleasant, agreeable girlfriend for my brother, and a shining student and beauty in our seaside community growing up. Everyone loved her. She thought she was nothing to me, insignificant and invisible. She wanted me to open my eyes and see her again so f**king badly, but she didn’t realize that I already did. I knew the deceiving c*nt that stewed underneath that perfect little sheen of hers, and I couldn’t forget. Until *something* happened that sent the bad-boy crew to prison (except for the ring-leader), and he hatched a plan upon their release. Until my brother leaves for the military, and I find Rika alone at college. In my city. Unprotected. Eeeeeep!!! Look out, Rika. They don’t like you anymore. And maybe they never did. But those masks. They were the only ones who wore those masks. Why would they come here? After three years, why would they come here? So overall, there were parts I enjoyed that had me reading on the edge of my seat, and many moments where I found myself huffing and puffing and eye-rolling with annoyance, which had me putting it down often. My biggest struggle was, strangely enough, what had actually attracted me to the book in the first place. I was excited by the bully concept, and the unrequited love of said bully. But it was the immense power that these boys had, not just over her (that’s understandable since she looked up to them, revered them so much) but that they seemed to have power over everyone. Adults, teachers, society as a whole seemed to bend to their will (for the most part) and accommodate their behavior. Of course some things get pushed too far, landing them in prison (so it’s not all fun and games and control, for them). But, I dunno. The power of this group, to me was… unconvincing. How they treated their peers, how patronizing they were, their threats, and how successful they were with the threats. It just left me cold (which of course is the goal – we’re not supposed to like them), but also had me reading from the outside. I never fully connected with the heroine. I never became her. Instead, I was annoyed and skeptical. Maryse: I’m still reading Corrupt, my friends. First half was a little harder for me to get through… just… trudging I suppose, because I didn’t “get” it yet. And I have a hard time with teenage boys having that much power and clout. LOL! But once we hit that part where she smashes the store window… HOLY MOLY it picked up hard from there… That said, I’m back to struggling with their plan and how they are working her over. I’m all… OH HELL NO!!! LOL! Moments of awesome reading and moments of dubious Maryse. I just couldn’t “go with it”. How they spoke to her, at times seeming as if they had an “all knowing comprehension” of the world, how they spoke to each other… the things they thought they were entitled to. It had a touch of that “Cruel Intentions meets Gossip Girl” self-indulgent, rich kid drama that I struggled with too much to love it. Boy-men with that much power? I don’t care how much money they have. And I know books are supposed to be a fun escape and I should have just gone with it, but this… these frat-boy types? I’m just struggling with the fact that they are this level of badass. Had they been older, real men with experience and true position of power (politicians, law enforcement, or part of the mafia, or MC men, or I dunno… bad guy killers-for-hire), yes… I would have believed it. Things to me didn’t always add up, and I wanted to scream at her! UGGGHHHH. GAH!!! I mean I guess that could happen… but these guys have ALL THE POWER? I dunno. *grumbles* all powerful entitled man-boys that “rule” and terrorize in their scary masks. Stupid rich [email protected] getting away with sh!t… UGH. *pfffffft* Please. Self-indulgent, pompous, patronizing, pretentious &%$#@* boy-men… grumble grumble* <— LOL!! Those are a few of my notes. Yeah… I was mad. By the way… the masks were kind of… AWESOME. LOL!!!!! I actually loved that crazy horror-movie touch. *snort* I’m so contradicting myself in this review. Lisa M: Hot hot hot!!! For those of you that have finished you know what I’m talking about!!! Oh yes!!!! OMG HOT!!!!!! There was a scene that when I realized what was happening I became seriously annoyed again, and was about to start skimming because again, my mind went into “oh yeah riiiiiiiight” mode, but I continued reading, curiosity getting the best of me that it was actually going there. Almost seemed outta place. But my annoyance as to the fact that I couldn’t believe my eyes, had me continuing, just to make sure I was “understanding” it. LOL!!! And then I realized I had read every single word right to the very end. Every. Single. One. Tee hee!! And ummm… yeah. HOT. I agree with you! I didn’t really enjoy it as I felt it didn’t portray what the blurb ment. There were times when it was confusing and very unrealistic! I did finish it with a bit of a struggle! I suppose we all have different opinions!! Just finished this morning. This book was WAY HOT in what felt like a fresh way. There was this haunting, slow build, intrigue… The hot scenes were pretty scorching. It felt different than what’s new out right now. I’ve never read anything by Penelope Douglas but plan to. I agree with your review Maryse too…there were definitely areas where you had to suspend disbelief, know you weren’t going to get more info or some over-it-too-quickly reactions… But overall it was a definite page turner. And I’m still thinking about it! And wow, those masks!!!! Wow. I also had a hard time with it. It was hard to connect with any of the characters and there’s just a fine line for me with these books with the mean boys/bully situations. I loved Bully- it went to that edge and pulled back. This one just went over that edge and I found myself hoping our heroine would just move away and be done with all of the mean boys. I DNF . . . . I couldn’t overcome some the things they (boys) did to girls, her mother and her. I not really a prude . . . I Loved “Forbidden” and the “Dark Duet” series. It was a little over the top and I found no redeeming qualities in ANY of the characters. I agree with it being a little confusing between past and present at some points. I liked the originality of it and apparently my “go with it button” was working! The heroine did annoy me at times though too! Lol! Great review Maryse! I had been looking forward to it!